CAPTION: Tami Riekena, first grade teacher at Dewey School, works with some of her students on their reading skills in her classroom. Several Chillicothe R-2 School employees and teachers were honored Monday, December 3, 2007, during the 16th annual Teacher of the Year program held in the Chillicothe High School commons area. District Superintendent Dale Wallace served as master of ceremonies and aided by R-2 board president Eric Reeter, the two honored several district employees for their years of service. However, the highlight of the event occurred at the end of the program with the announcements of the first-ever Beacon Award and the 2007 Teacher of the Year Award. Respecively, those two awards went to Gary Eide, custodian at Grand River Tech School, and Tami Riekena, 1st grade teacher from Dewey School. Ed Douglas, Chillicothe Education Foundation president, made a few brief remarks and distributed awards totaling a combined $800 to Eide and the other staff members nominated for the Beacon Award. 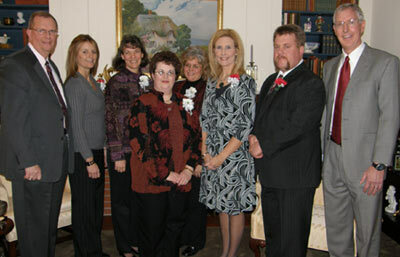 He also presented awards totaling $10,000 to Riekena and the other teachers nominated for the Teacher of the Year Award. In presenting the Beacon Award, Wallace told those gathered that the award received its name because the individuals nominated for it "shine from behind the scenes" in their respective positions. The six individuals who were nominated by their schools were being recognized because of their dedication to their position, their profession, and to the children and staff of the district. Those nominated also included Connie Quigley, behavior management paraprofessional and food service clerk from Dewey School; Linda Wolf, Field School secretary; Kathy Rinehart, Central School secretary; Mary Lou Wilhoit, Chillicothe Middle School secretary; and Rick McCully, Chillicothe High School custodian. 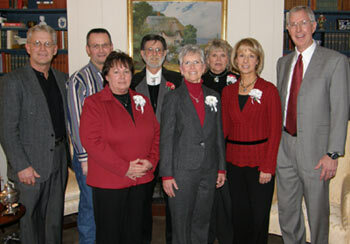 As the 2007 Beacon Award winner, Eide received $300 and each nominee received $100 from the Chillicothe Educational Foundation. As introducing Eide as one of the nominees for the award, Wallace noted that the custodian has worked at Grand River Technical School for 17 years. "Ask anyone who knows Gary and they will speak of his leadership, compassion, loyalty, dedication, and caring heart," Wallace said. He added that Gary is quick to speak of the success of others, downplaying his own role in the success of the school. "Many know (Eide) as he greets them every evening, others will have their questions answered as he mans the front desk, and for others it is just his smile that touches their lives," Wallace said. In presenting the 2007 Teacher of the Year Award, Wallace noted that each nominee receives $500 cash and $1000 for educational supplies, equipment or professional development. He added that as the 2007 Teacher of the Year, Riekena receives $1500 cash and $1000 for educational expenses from the Chillicothe Educational Foundation. In announcing Riekena as the 2007 Teacher of the Year, Wallace explained that Riekena has a firm and simple belief: One teacher can do great things and a community of teachers can move mountains. "(Riekena) demonstrates this every day through their involvement with her students, her school, her church and this community," Wallace said. Riekena was one of six teachers nominated for the Teacher of the Year award. Others up for the honor were: Tracy MIller, third grade teacher from Field School; Kim Bloss, fourth grade LD/EMH instructor at Central School; Kristy Clampitt, sixth grade language arts teacher from Chillicothe Middle School; Donna Buzard, Spanish teacher from Chillicothe High School, and Lee Caughron, industrial welding instructor from the Grand River Technical School. 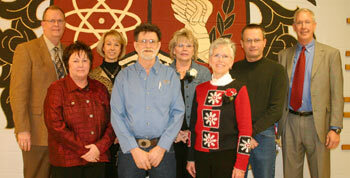 Reeter also distributed plaques and pins to R-2 teachers and staff members for their years of service to the district. Phyllis Reith, R-2 bus driver, received a plaque for 35 years of service. 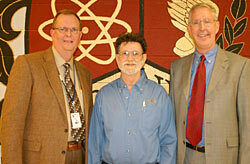 Assistant Superintendent Dave May also received a plaque for 30 years of service to the R-2 district. Those receiving 25-year plaques were: Pam Gabel, high school science; Vickie Garrett, middle school physical education; David Goodwin, high school instrumental music; John Knouse, Central School custodian; Tami Riekena, first grade from Dewey School; and Bill Tharp, Grand River Technical School computer technology. Teachers and staff receiving 20-year pins were: Stan Baldwin, high school industrial technology; Stephanie Baldwin, middle school special education; Charlotte Miller, Central School fifth grade; Mary Quinn, GRTS secretary; Carol Radel, Central School fourth grade; Brian Thompson, GRTS agricultural education; Shelly Turner, Dewey School Title 1 reading. All those attending were invited to a reception with refreshments following the program in the commons area. CAPTION: The nominees and the recipient of the Chillicothe Educational Foundation's Teacher of the Year were recognized during a dinner reception last (Wednesday) evening at the home of Ed Milbank. 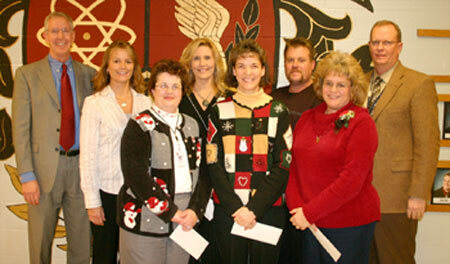 Pictured, from left are: Dale Wallace, Chillicothe R-2 superintendent; Kristy Clampitt, sixth grade language arts; 2007 Teacher of the Year Tami Riekena, first grade; Donna Buzard, Spanish; Kim Bloss, fourth grade, LD/EMH; Tracy Miller, third grade; Lee Caughron, welding; and Ed Douglas, Chillicothe Educational Foundation president. The Chillicothe Educational Foundation's dinner reception last (Wednesday) night for the honorees of the R-2 district's Teacher of the Year Awards and Beacon Awards netted the foundation an estimated $18,000 to $19,000. The event was held at the home of Ed Milbank, a foundation board member who has hosted the event for the past several years. The gathering is the largest fund-raiser of the year for the foundation, which works to encourage and promote excellence in education. Ed Douglas, president of the Chillicothe Educational Foundation, spoke briefly to the crowd and thanked them for attending and generously donating to the foundation. "2007 marks the 16th year the Chillicothe School District has recognized excellence in the classroom by naming a Teacher of the Year," Douglas said. "With the generous support of the Chillicothe Educational Foundation, we are pleased to be able to award $10,000 to six individuals who are truly dedicated to their profession and representative of excellence in the classroom." The money raised through the evening helps fund the foundation's Mini Grant program, the administration of several scholarships and the foundation's Teacher of the Year program. The Teacher of the Year program provides nominated teachers cash awards and funds for education supplies, equipment or professional development. Each of the nominees receive $500 cash and $1,000 for educational supplies, etc. The winner of The Teacher of the Year Award receives $1,500 cash and $1,000 for educational expenses. Douglas introduced the nominees and the winner of the Teacher of the Year Tami Riekena, Dewey School first grade teacher. Others up for the honor who were recognized were: Traci Miller, third grade teacher at Field School; Kim Bloss, fourth grade LD/EMH at Central School; Kristy Clampitt, sixth grade language arts teacher at Chillicothe Middle School; Donna Buzard, Spanish teacher at Chillicothe High School; and Lee Caughron, welding instructor at Grand River Technical School. Others who were recognized were Beacon Award nominees. "We are pleased to be able to recognized the first ever Beacon Award winner," Douglas explained. "This award is called the Beacon Award because these individuals shine from behind the scenes in their respective positions." This year, six individual nominees were recognized for the dedication to their position, their profession and to the children and staff of the Chillicothe R-2 School District. "We are very grateful for the work they do," Douglas said. Each Beacon Award nominee received $100 cash and the winner received $300. Douglas introduced the nominees and the winner of the Beacon Award, Gary Eide, custodian at Grand River Technical School. Others up for the Beacon Award honor were: Connie Quigley, behavioral management paraprofessional and food service clerk at Garrison and Dewey; Linda Wolf, secretary at Field; Kathy Rinehart, secretary at Central; Mary Lou Wilhoit, secretary at Chillicothe Middle School; and Rick McCully, custodian at Chillicothe High School. Douglas recognized other members of the Chillicothe Educational Foundation Board: Dale Wallace, Dave May, Ed Milbank, Brenda Fellhoelter, Mary Staton, Inger Young, Mike Turner, Bruce Brodmerkle, Julie McCoy and Lindy Chapman.